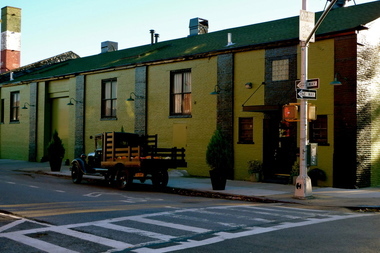 The Green Building, a popular wedding venue in Gowanus. The property was once an industrial site and it's slated to undergo an environmental cleanup. GOWANUS — A contaminated former industrial site that's now home to a popular wedding venue is about to get an environmental cleanup, state officials announced recently. The land surrounding The Green Building on Union and Bond streets is slated to undergo the cleanup as part of the state’s Brownfield Cleanup Program, which gives developers tax breaks in exchange for cleaning polluted land. The state's Department of Environmental Conservation took an early step in the cleanup process on Nov. 10, announcing that it's accepting public comments on a proposal for how to investigate contamination at the site. The property overlooks the Gowanus Canal, one of the most polluted waterways in the United States. The proposed investigation plan for the site, at 450 Union St., calls for sampling the soil and groundwater to "define the nature and extent of contamination in soil, groundwater and soil vapor,” according to the DEC. The public can comment on the plan until Dec. 14. After the environmental investigation is completed, a plan will be developed for how to remove the contaminants. The public will also be invited to comment on that plan, which must be approved by the state Department of Health. The DEC will then supervise the cleanup of the site. The Green Building owner Akiva Reich said the investigation and cleanup will encompass only a small part of the Green Building's property. "It's a small area," Reich said. "It's not going to affect any of our operations." Properties along the canal are riddled with contaminants left over from the days when the waterway was used as a dumping ground for industrial businesses. Because the contamination at 450 Union St. hasn't been investigated yet, state officials don't know the extent of the pollution at the site. But Reich said the contamination is "absolutely not" a health risk for people who visit The Green Building. "There's no real environmental issues on our property," Reich said. The property's industrial use dates back to at least the 1880s, and it's been home to a coal and wood yard, a granite works, a die casting facility, a garage, and other businesses, according to the DEC. Petroleum was stored on the site for at least 63 years, and there was also an underground gas storage tank there, according to the DEC.
From 1930 to 2007, 450 Union St. was a brass foundry. A developer floated a plan to build condos on the site in 2002, but locals shot down the idea. Reich opened the Green Building reception hall on the site in 2008. It hosts weddings and other private events and Reich has since expanded his mini empire of rental venues to include an art gallery and 501 Union, a private rental space across the street from The Green Building. Reich said last year that despite local fears, he had no plans to convert The Green Building into residences. In the summer of 2015, Reich converted an outdoor area next to The Green Building that overlooks the Gowanus Canal into a temporary barbecue joint. He declined to discuss any future development plans for his property during a Nov. 20 interview with DNAinfo New York. The Green Building is one of several properties along the Gowanus Canal that will be (or have been already) cleaned up under the state's Brownfield Cleanup Program. Others include the property at 365 and 363 Bond St. where two high-rise apartment buildings will soon open to renters, a former fuel depot just north of the Union Street Bridge, and the future site of the Gowanus Green housing development. While the state leads the Brownfield Cleanup Program to rid the polluted land around the Gowanus Canal of contaminants, the U.S. Environmental Protection Agency is leading a $506 million Superfund cleanup of the canal itself. To submit comments on the proposed contamination investigation plan for 450 Union St., see the DEC's fact sheet on the site here.